wats the meaning of bullet proof movement?? Looking for white/black dial with diamond markers and diamond crusted bezel men size date just for my wife. Any one has any recommendation on the model? Likely to buy in HK since I am heading there soon. Can anyone tell me which box goes with a P series 79174 ss pink dial? And what kind of booklets should there be? Managed to get the DJ MOP for the missus today...!!! Yeah this Datejust MOP really suits a lady well. Have bought one for my my lady last week. And I couldn't resist temptation got myself DJ II WG 2 days ago. I'm also contemplating if I should get a DJII in same style to match..hahaha!!!! I got mine to match her's when we attend functions. Edit: I did not get the MOP dial. Mine Blue dial Roman numerals. wow gorgeous. how much % did u manage to get? im aiming for the meteorite dial 31mm but AD max offer 12% only. Now you can get 12%? Mind to share which outlet you went to? i went watch palace @ lucky plaza. greyseller offered 20% though but no stock. I'm not sure if they have the 31mm meteorite that you're looking for but maybe you can give the AD @ Peninsula Plaza a try. (Lee Chay Watch)I was offered 15% without much haggling. I was also looking for 31mm. Posting a newbie question, I hope the fellow community here can help shed some light. I apologies that i don't know how to attach photo. 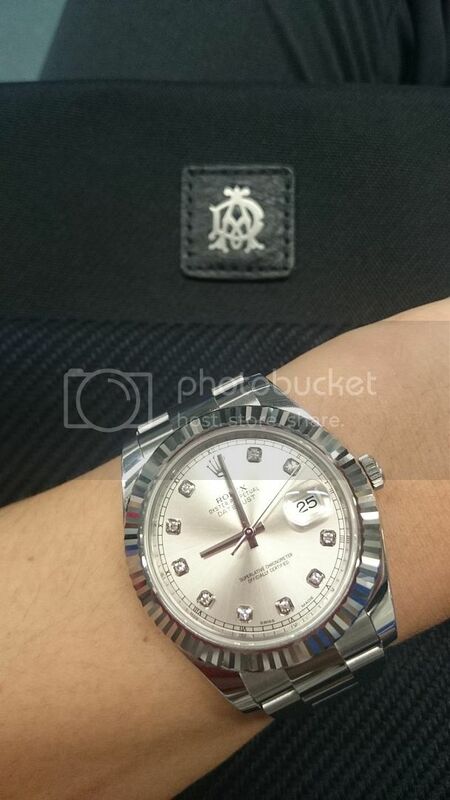 I'm looking at Datejust 178271. 31mm jubilee strap with diamonds on "VI" on fluted bezel and chocolate dial. The best discount that local AD is offering 15% off by paying AMEX. With the 15% discount and AMEX rebate, i'm getting around 19.25% off the list price. But my friend was saying that he can get it way cheaper from Europe AD when he goes on business trip in September. My question is, is it even possible? Anyone have similar experience to share?